I can’t believe they hadn’t captured my heart before now, but the craze had just past me by until recently. 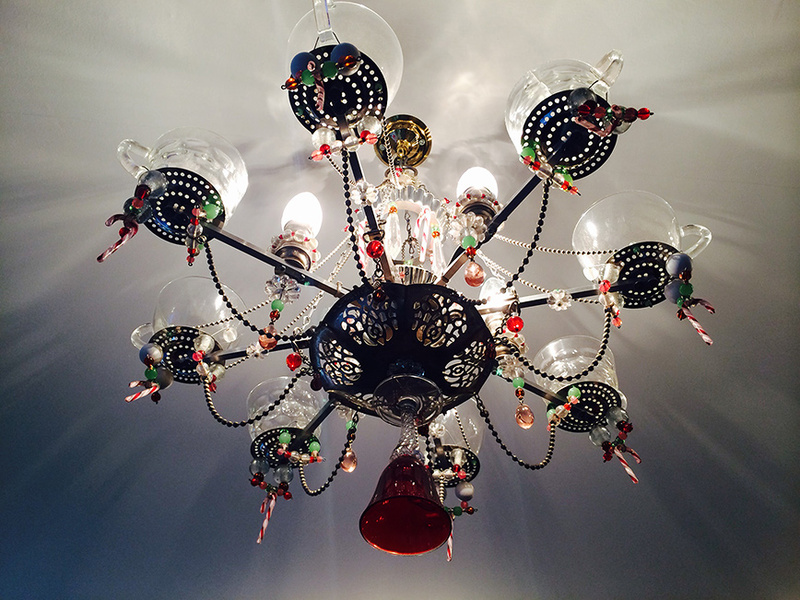 Whilst visiting a gorgeous little chocolateries in Edinburgh I came across the chandelier above. 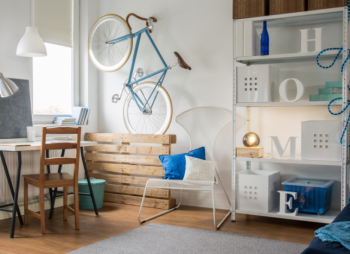 It has so much character and so inventive. 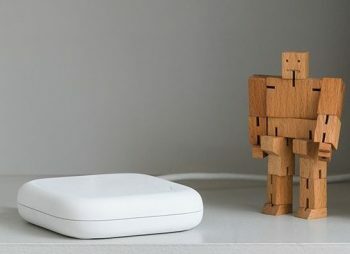 I don’t think it would be to hard to make it myself either. 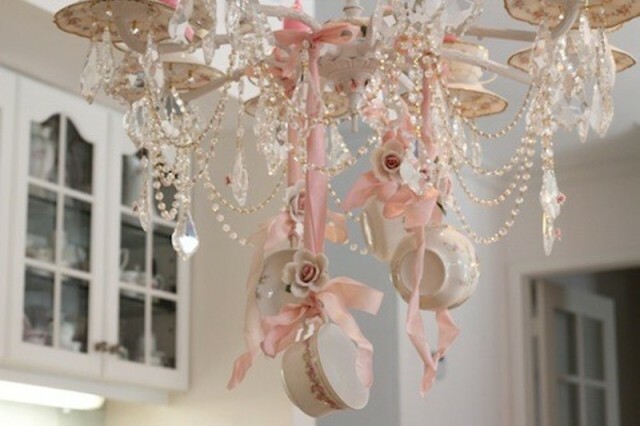 There are so many different and inventive ways to style the Teacup chandelier, with some looking kitch, others shabby chic, or stylish and many looking rather regal. To be honest I had trouble narrowing the list down to my favourite 12. 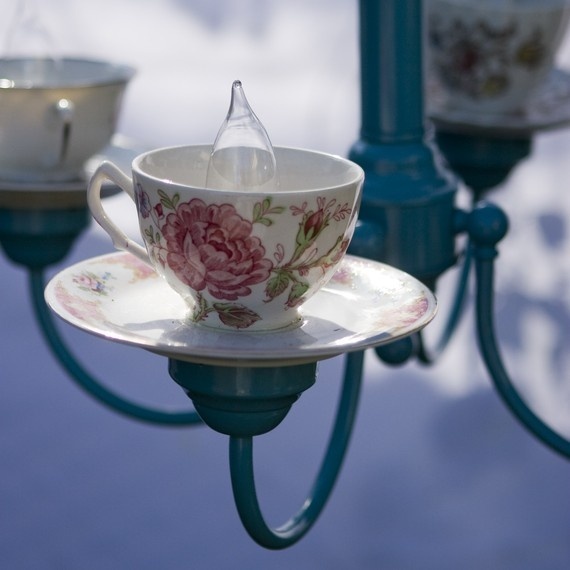 This Teacup Chandelier is adorable and easy to achieve. 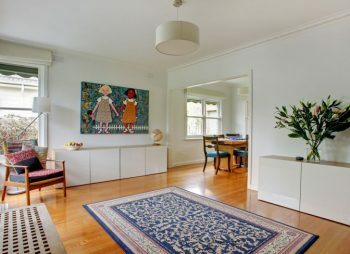 With a chandelier that already functions as a central light in the room, you don’t have to fiddle around with glue or rewire any electrics, just tie the ribbon to the arms of the Chandelier and to the Teacup and you have one very unique Chandelier. I do feel the person who made this had a good feel for what would actually go well together, with the different hues of purple and pinks and the subtle pink roses, it gives the Chandelier and the room a really warm and vintage feel. 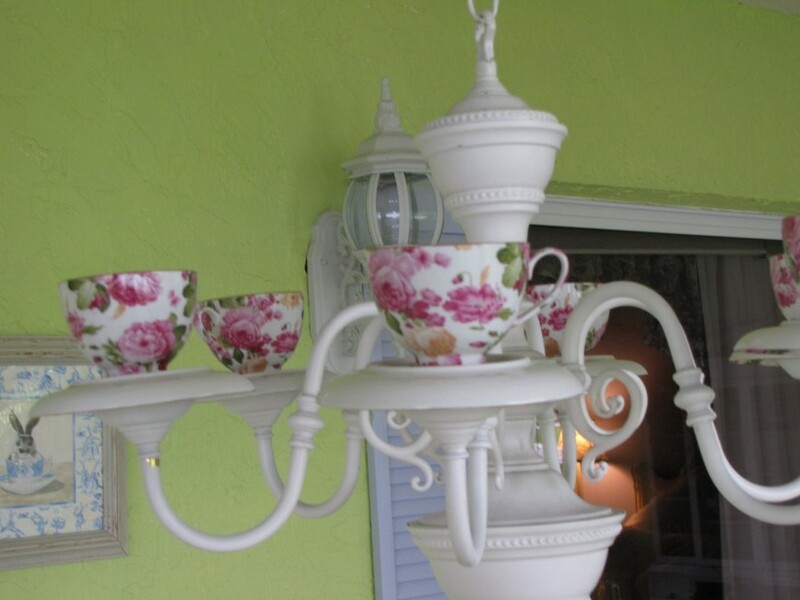 Parts of this Teacup Chandelier are easy to achieve just as the previous picture, by tying the teacups to the arms of the chandelier. 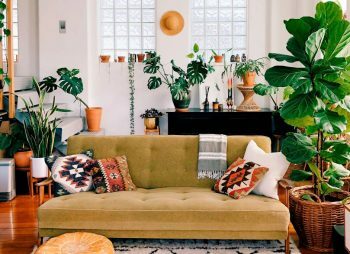 The milk jugs and sugar tongs are a nice touch too. To attach the cups and saucers a hole needs to be made, this can be achieved by using a diamond core drill. A great explanation on how to drill through plates can be found here. 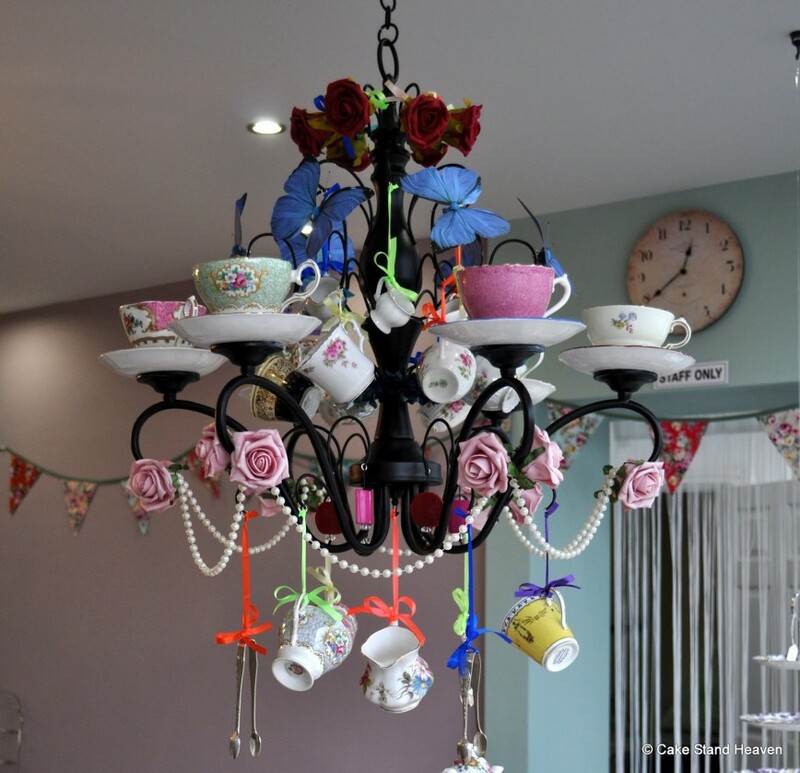 Simple and stylishly designed Teacup Chandeliers can have just as much of an impact in a room as a more flamboyant design. 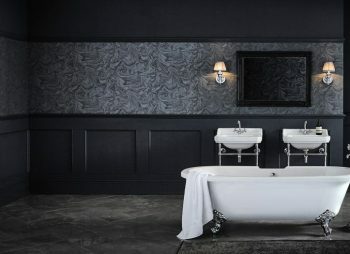 The pictures above shows just how appealing a look can be, by coating the body and arms with paint and simply adding decorative teacups and saucers. 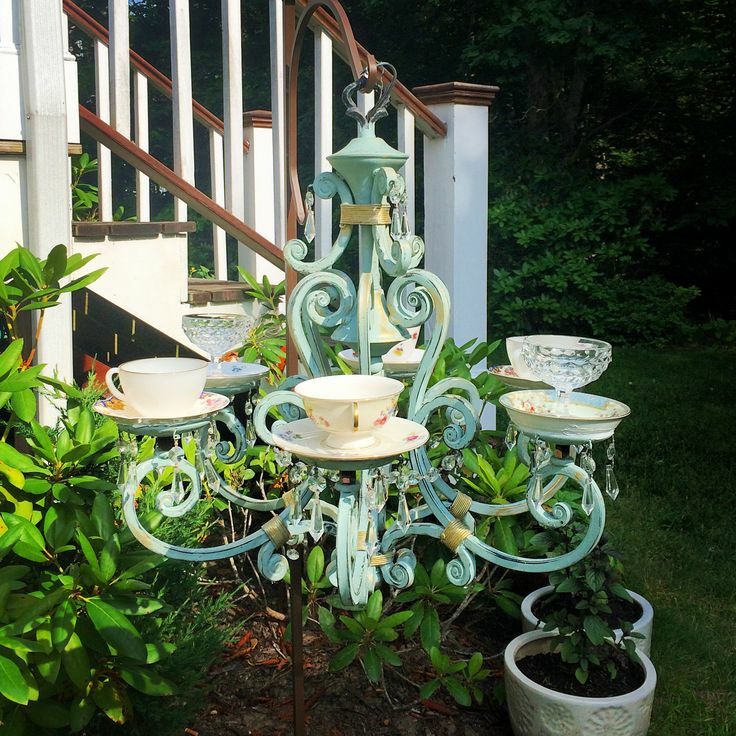 Teacup chandeliers look wonderful as a stunning feature piece in the garden too. 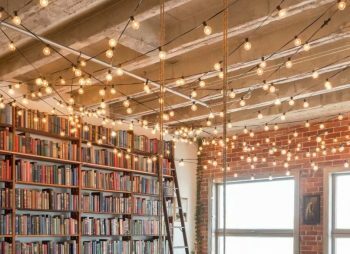 Most people won’t have a power supply to attach the chandeliers to outside, but that isn’t a problem at all. 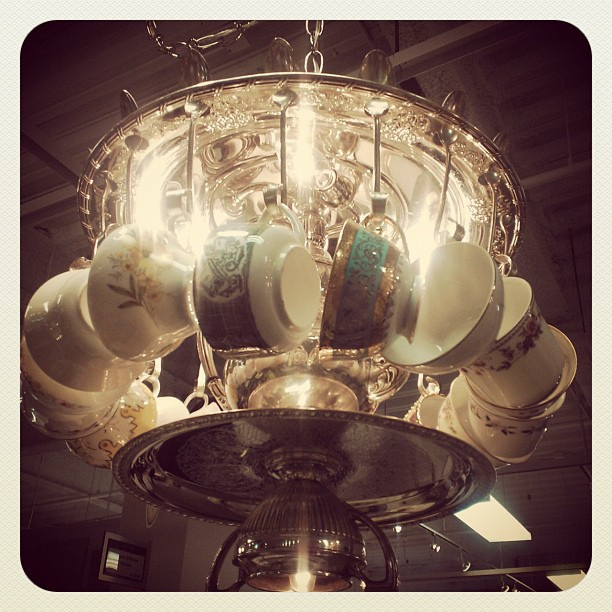 Like the Teacup chandeliers above they can still be functional, but in different ways. 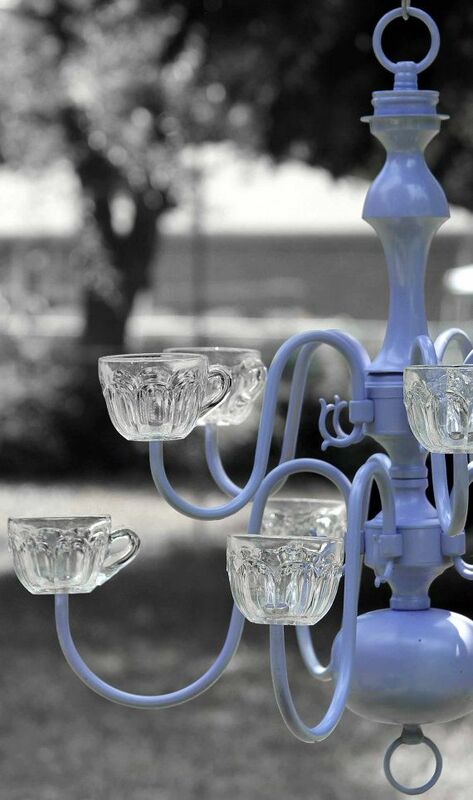 Adding a few plants and turning the cups and saucers into bird feeders, or placing candles into the cups are great ideas. 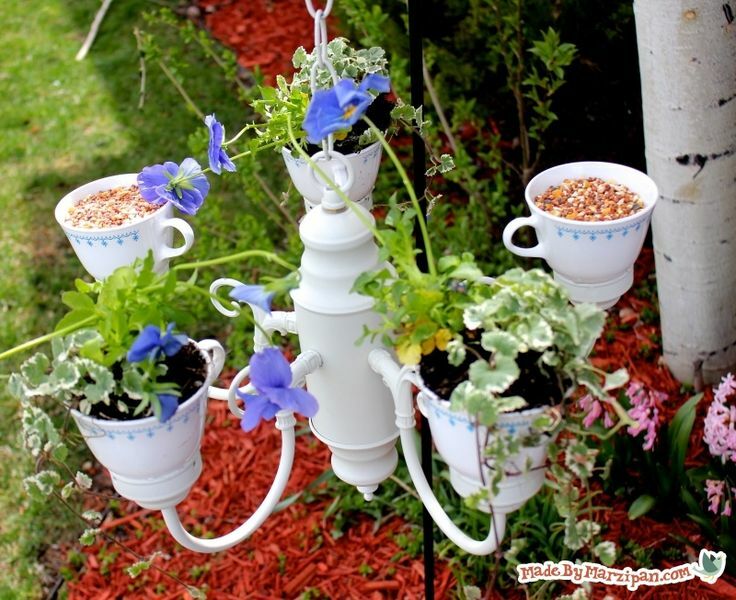 To see a video on how to turn a chandelier into a planter and bird feeder click here. 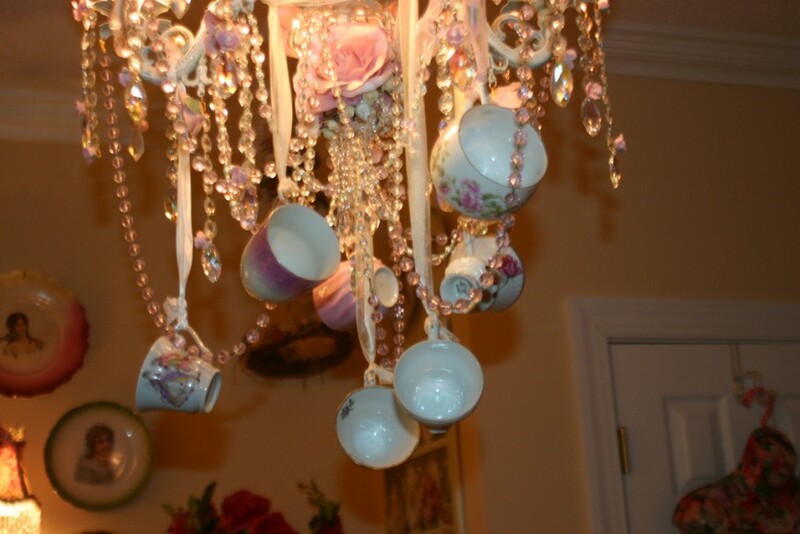 If I was planing an Alice in Wonderland Themed party, this is the chandelier I would chose. 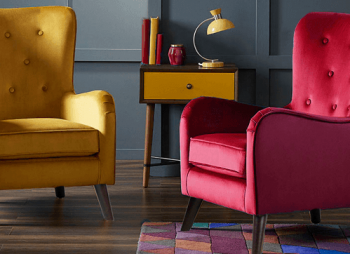 It’s quirky, stylish and fun all in one. 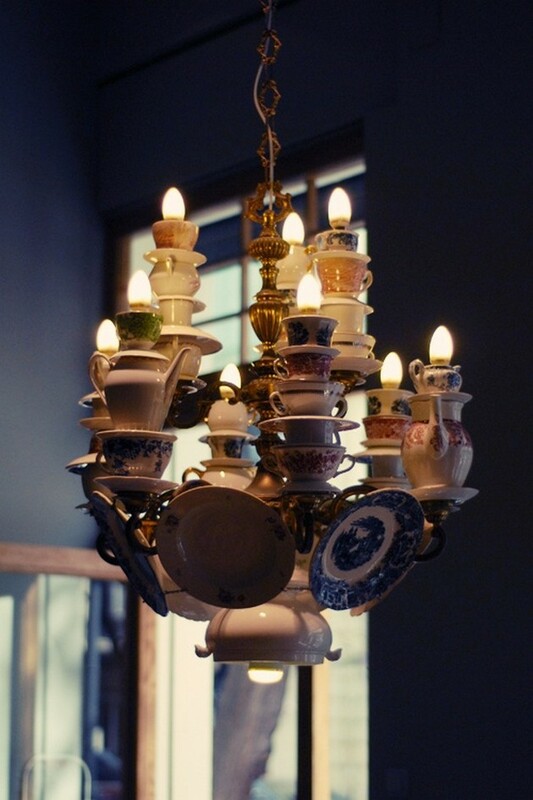 The use of the teapots are a great idea too, making the chandelier really stand out. 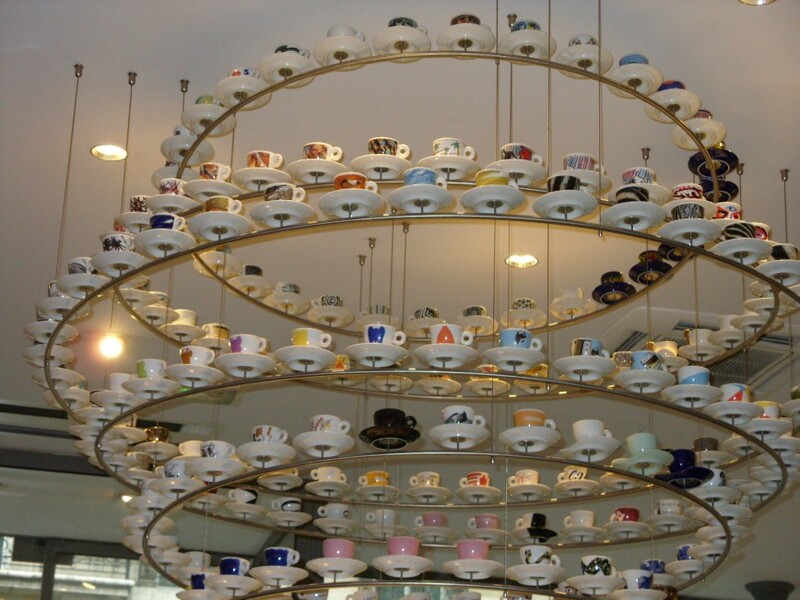 Many cafes, coffee shops and public spaces have embraced the Teacup chandelier over the years, and some as you can see above have taken it to a whole new level of size and style. Again it was hard to chose my favourites, but these three are truly something special. 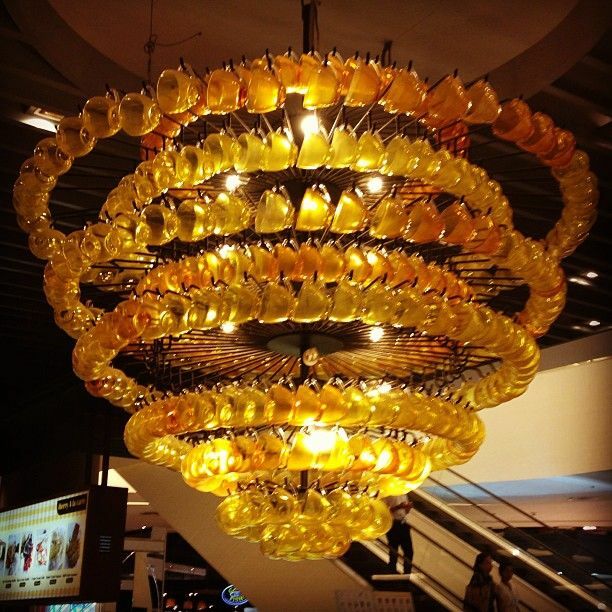 The options for these chandeliers are endless, our imaginations being the only thing to stop us. 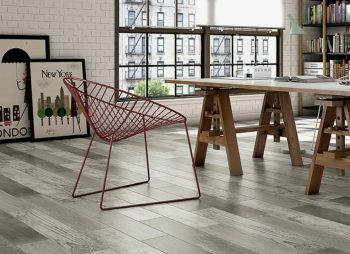 If you have enjoyed this post, please share and press like on the buttons below.